HALBAN The “International Start-Up Workshop Ports and Trans-Ports. Evolution and Revolution(s) in the Indian Ocean World” exploring historical and contemporary networks and mobility on sea and on land within the Indian Ocean was held at GUtech recently. The workshop was organized by the Research Centre Indian Ocean (RIO) in cooperation with Martin Luther University Halle-Wittenberg (Germany), the Max Plank Institute for Social Anthropology (Germany), Sindh University (Pakistan) and the International Council on Monuments and Sites (ICOMOS). A large number of international scholars from various universities in Europe, the Middle East and Asia were participating in the three-day workshop and a field-excursion. On the sidelines of the conference held at the History of Science Center at GUtech, a Memorandum of Understanding was signed between GUtech and the University of Sindh, Jamshoro (Pakistan) in order to promote and encourage scientific research and academic collaboration in various fields. 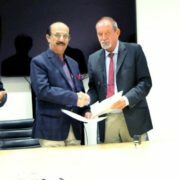 The MoU was signed by both the Rectors and by Prof. Dr. Michael Jansen (RIO – Research Center Indian Ocean) and Prof. Sarfraz Hussain Solangi (CIVIS – Center for Indus Valley Integrated Studies). Different Memoranda of Understanding with the Universities of Martin Luther University Halle-Wittenberg and the Aga Khan University in London are under preparation. The field-excursion of the conference was headed by Prof. Dr. Michael Jansen, who is an archaeologist and the Founding-Rector of GUtech. The five day excursion included historical archaeological sites like Qalhat, Bibi Maryam Tomb and Duqum with its modern port developments, followed by Salalah, Khor Rori and the ancient frankincense port of Al Baleed. Sumharam (Khor Rori) and Al Baleed are one of the oldest historical sites in Oman, showcasing the rich maritime history and links within the Indian Ocean. Together with the “Land of Frankincense” Wadi Dokar and both the sides have been listed as one of Oman´s UNESCO World Heritage sites in 2000 as well as the ancient port of Qalhat in 2018. Prof. Dr. Michael Jansen, Director of RIO, explained that first interregional networks developed between the Indus Valley, Mesopotamia and Oman in the Third Millennium. Other networks developed along the river Nile, the Red Sea and the Mediterranean. Later on, many more networks developed out of which the Roman network connected the Roman Empire via the Red Sea to India, and Malakka to China. 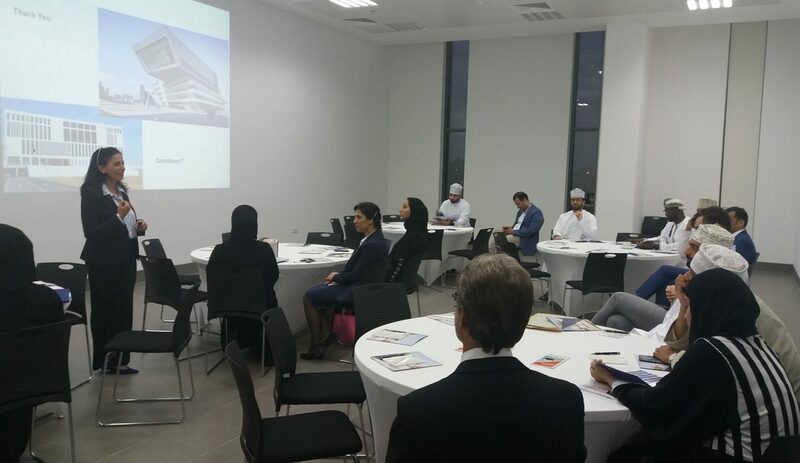 HALBAN The German University of Technology in Oman (GUtech) hosted a general information session on its new Master of Business Administration (MBA) programme recently. Vienna University of Economics and Business (WU), the partner-university for the MBA programme, is one of the largest and leading business universities in Europe. The university was established in 1898 and founded as the Imperial Transport University. “Our unique GUtech-WU MBA programme has a triple international accreditation from the most sought-after international accreditations: AACSB, AMBA, EQUIS. The 18 months programme will offer a double degree from GUtech and the prestigious Vienna University of Economics and Business (WU) in Austria. Our programme is suitable for professionals with at least three years of work experience who would like to enhance their management skills,” said Prof. Dr. Heba Aziz, Dean of the Faculty of Business and Economics at GUtech while adding that only 10 per cent of the MBA programmes worldwide have a triple accreditation. The majority of the joint MBA programme, 75 per cent, will be taught by academics from the University of Vienna and 25 per cent by GUtech academics. “The programme offers specialisations in International Tourism, Entrepreneurship and in Logistics. To complete the MBA a total of 90 credit points are required and the majority of the class-work will be conducted in teams,” said Prof. Heba Aziz. The programme will be taught in a so-called 3-tier modular structure through GUtech’s e-learning platform. Entry requirements include IELTS 6.0 but language proficiency could be checked during admission interviews. The Bachelor degrees have to be recognised in Oman and in Austria. Prior to acceptance of the application, all candidates will undergo an interview with GUtech and WU academics who teach in the MBA programme. “Having worked in the private sector in Oman for several years, I would like to enhance my overall career opportunities and my management skills,” said one of the participants in the session. Scholarships are also available. The first 25 applicants will receive a discount of 30 per cent. In addition, Bank Muscat offers the ‘Shahadati Educational Loan’, covering the tuition fees and other study-expenses. The educational loan will be based on the applicants’ monthly salary. Admissions for October 2019 intake are open till 15 August. More information about the courses and tuition fees are available at https://www.gutech.edu.om/academic/business-economics/master-business-administration/. HALBAN Under the auspices of H.E. Ali Bin Mohammed Al-Abri, Undersecretary of the Ministry of Regional Municipalities and Water Resources, the World Water Day was celebrated at the German University of Technology in Oman (GUtech). During the event Eng. Salim Al Khanbashi from the Ministry of Regional Municipalities and Water Resources spoke about the projects of the Ministry and its achievements in protecting Oman’s natural water resources including the falaj system. During an exhibition outside the GUtech Research Hall, a number of high school students from different schools showcased their thoughts and inventions which were then discussed within a panel of GUtech professors from the Department of Environmental Engineering and Applied Geosciences. For example, Tariq from Mohammed Bin Sheikha School showed his thoughts about the use of grey water in agriculture and for power generation. “The amount of fresh water is decreasing. We need to stop wasting water,” said Umme Habiba, from the Bangladeshi School while thinking about the use of water in homes as well as in industries. Thinking about the development of desalination plants to increase the water consumption, she is concerned that desalination plants dump the remaining salt into the sea, which then harms the natural environment. In her everyday lives at home, she and her friends try to save water. Saving rain water in a tank and using it for irrigation and agriculture was another student project. The students also addressed climate change and its effect on water resources worldwide. “Global warming is increasing worldwide. 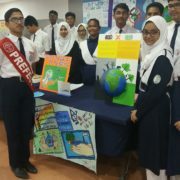 We need cleaner solutions for our planet,” said another female student from the Bangladeshi School Muscat. In her project she highlighted that hydroelectricity can be a cleaner source of energy, compared to nuclear power, fossil fuel or coal. A theatre play by GUtech theatre group presented the negative consequences of disposing plastic in the natural environment. 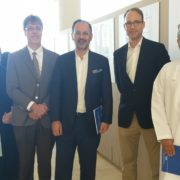 HALBAN The Oman Academic Accreditation Authority (OAAA) conducted the visit for the Institutional Standard Assessment of the German University of Technology in Oman (GUtech) last week. An international panel of higher education experts visited the university and conducted interviews with GUtech staff members. “Valuable contributions were given by representatives of the Board of Governors, Board of Directors, staff and students of GUtech as well as a number of external stakeholders including employers of our graduates, internship hosts, scholarship providers and most important are our GUtech alumni,” said Dr. Alma Enriquez, Head of Quality Assurance and Planning Department of GUtech. The OAAA panel members were highly experienced experts from Australia, Austria, Portugal and Oman. The Standards Assessment determines GUtech’s ability to meet OAAA internationally benchmarked external standards and criteria. GUtech already went through the OAAA’s Quality Audit in 2013. The report of the audit is published online on OAAA’s website. 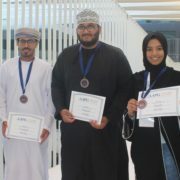 “The OAAA Quality Audit report already confirmed the high quality of GUtech, its programmes and its facilities. Now we are going through Institutional Standards Assessment, which looks into the details of nine different standards,” said Dr. Armin Eberlein, Deputy-Rector for Academic Affairs. He added that GUtech found the preparation for this event useful in strengthening quality processes. Within a few months, the OAAA will provide GUtech with a detailed report of its findings. The Oman Academic Accreditation Authority (OAAA) initiated a review and revision of the institutional standards which govern the accreditation of higher education institutions in Oman in 2011. Once a university has been accredited, the university is required to go through Standards Assessment every five years in order to maintain their accreditation status. 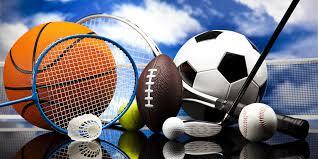 The Standards Assessment is an extensive audit covering every aspect of the operations of an institution. MUSCAT The third joint SAP-GUtech/OES Industry workshop highlighting challenges and opportunities of the digitalization of the construction industry was held at the Crowne Plaza Muscat Convention and Exhibition Centre yesterday. GUtech assumed the task to set-up a SAP NextGen Chapter in 2018. SAP has been facilitating a SAP Dual Training for 25 SAP selected students. “The construction industry contributes with 9% to the Oman’s GDP and is the country’s largest employer. The sector has a huge potential for job perspectives related to Intelligent applications. Our intention with this workshop is to create solutions that enhance socio-economic growth values for society and for its citizens,” said Heiderose Moossen, Manager Vocational Training and Industry Relations, GUtech, TSSC Department and main organizer of the event. Especially Building Information Modelling, Augmented Reality, the Internet of Things, in-memory and graph computing could provide new business value and operational excellence. 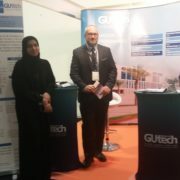 To link the academia and the industry, GUtech has set-up a NextGen Lab in collaboration with SAP last year. “We wish to listen to students, our future employees and build up their skills for the future,” said Mohsen Al Lawati, Accounts Manager at SAP who introduced SAP to the audience. The construction industry is one of the least digitalized sectors worldwide,” said Mohsen Al Lawati. Challenges and opportunities of digitalization for the construction industry are diverse, including empowering females and reducing the gender gap in the construction and engineering field. “We female architects would like to go to the construction site” said Rafia Al Bahlani, a young architect who works for Atkins. Intelligent technologies could facilitate more female employment opportunities in operations. Prof. Dr. Nafaa Jabeur from the Department of Computer Sciences at GUtech said in his presentation on the “Intelligent Construction from the Sky” that there are many opportunities for the application of drones in the construction sector in Oman. These opportunities include enhancing operations while facilitating communications between decision-makers and workers, monitoring the daily progress of the construction site, 3D modeling, volumetric measurement, thermal imaging, optimizing costs for project management and maintenance, reducing health and safety threats, to improve the quality of work. 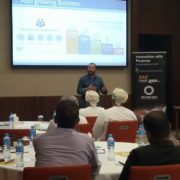 Jobin George, Business Development Manager from Bauer Nimr Oman introduced the application of the SAP Business One Software in Project Management. Bauer Nimr has been using SAP to streamline operations and to simplify processes, multiple cost units and to optimize the overall user productivity while creating more transparency. The Industry workshop closed with an open forum and a discussion, where the audience discussed and collected their vision on challenges, opportunities and the way ahead for Intelligent Technologies in the Construction Sector. Most feared is the high investment for systems, that digitalize and re-engineer operations of an organization and support its Project Management processes. However, these systems can also help save money: ARAMCO logged in their accounts 80 Mio USD / anno by introducing a customized SAP systems, that run its operations streamlined, efficiently with regard to cost and time savings. The opportunities would be found in safer construction sites, raise skill levels, gender equality, as site progresses can be monitored by women from their office desks. Eventually smart industries will become the norm and facilitate life and work quality for blue- and white collar employees alike. HALBAN A group of eleven GUtech students has successfully passed the German language certificate, Language Exam A1 of the Goethe Institut, the German Language and Culture Centre. “The certificate is the first internationally recognized German language certificate that has been issued by the Goethe Institut,” said Myriam Steinbock, German lecturer at GUtech. 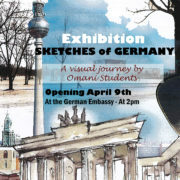 Studying German is part of the curricula at GUtech; students study the language for three semesters. However, the language of tuition at GUtech is English. The 90 minutes exam evaluates the speaking, writing and listening skills of students. Some students had the chance to already practice their language skills in Germany. Although English is widely used in international companies and at universities, it is an asset to speak and communicate in German on a daily basis. 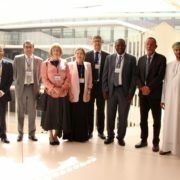 GUtech fosters exchange between Germany and Oman, especially through its German partner-university RWTH Aachen University. Each year a number of GUtech students from various departments participate in language courses, laboratory courses or field-excursions to Germany. German is one of the most important languages worldwide and the most spoken language within the European Union. Around 103,5 million people are German-native speakers in Europe; German is the official language in Germany, Switzerland and Austria.